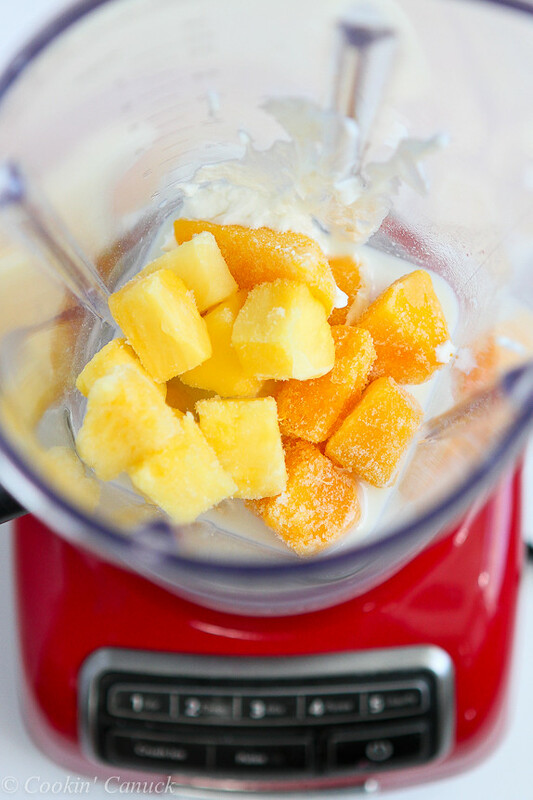 Infuse a little “tropical” into your life with this easy, healthy pineapple and mango smoothie. Plus, it has a secret ingredient for an extra punch of fiber. I realize that it’s still only February, but I am feeling decidedly tropical today. As in “squeeze into a bathing suit, adorn myself with a lei and sip on a Mai Tai” kind of tropical. We have never been on a tropical vacation as a family and we are practically doing headstands because our trip to The Big Island of Hawaii is just around the corner. Snorkeling and sushi and beaches…oh my! If you have been to the Kona area and have any restaurant (or other things) recommendations, I’d LOVE to hear about them in the comments section below! In honor of our upcoming trip, it seemed only right to pull out some mangos and pineapples (albeit frozen ones) and whip them into a healthy tropical smoothie. If I had any mini umbrellas, I would have stuck them on the side of this glass faster than you can say “Aloha, mahalo and hula.” That’s about the extent of my Hawaiian language knowledge. To give this smoothie an extra boost of fiber, I threw in a 1/4 cup of raw oats, which is a trick I learned from one of the instructors at the gym. Fiber is linked to all sorts of health benefits, such as lowering cholesterol, helping to control blood sugar levels and aiding in maintaining a healthy weight by making you feel fuller faster and longer. Adding whole grains to your diet will bump up your fiber intake in no time. If you’re making smoothies for more than one person, this recipe is easily doubled or tripled. 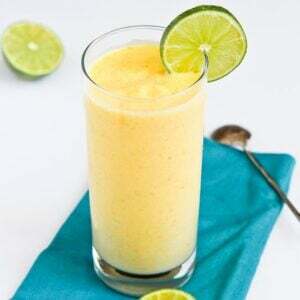 If you prefer to use fresh mango and pineapple, you may find that you have to decrease the amount of milk you use and add some ice for a thicker, frostier consistency. 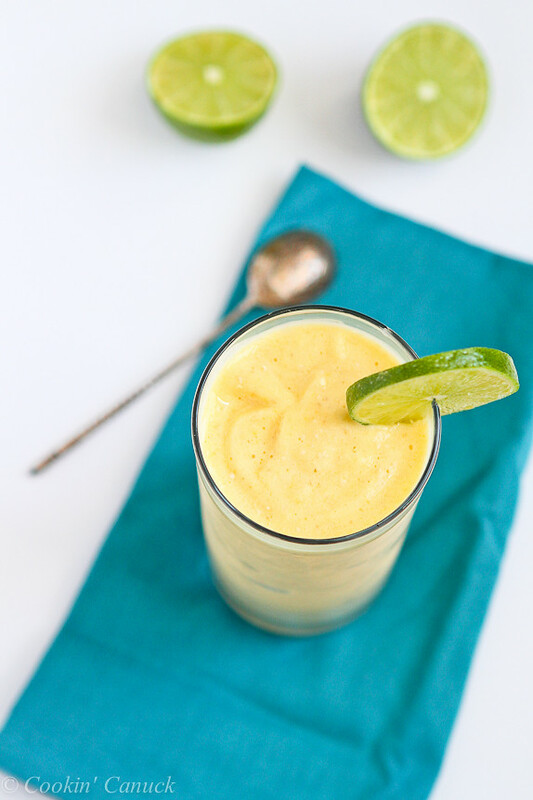 Infuse a little "tropical" into your life with this easy, healthy pineapple and mango smoothie. Combine all of the ingredients in a heavy-duty blender. Blend until smooth. Serve. I love seeing tropical recipes at this time of year. Have a great trip Dara! Enjoy every moment. Thanks, Katie! We can’t wait and we’re going to try to soak in every moment. Ooo! I love mango and oats in smoothies! I hope that you have a fantastic vacation on the big island. Please share photos with those of us in the frozen tundra so the we can live vicariously. LOL. Will do, Kirsten. I hope things start to warm up for you. It’s been a while, but my favorite place was the Canoe House at the Mauna Lani Bay Hotel, fantastic food and a gorgeous setting. Wonderful! Thanks so much for the recommendation. How exciting to be leaving for Hawaii soon! And what a good way to get in the spirit with this pretty smoothie! I love the oats trick too, I’ve never heard that before. You are going to love Hawaii! 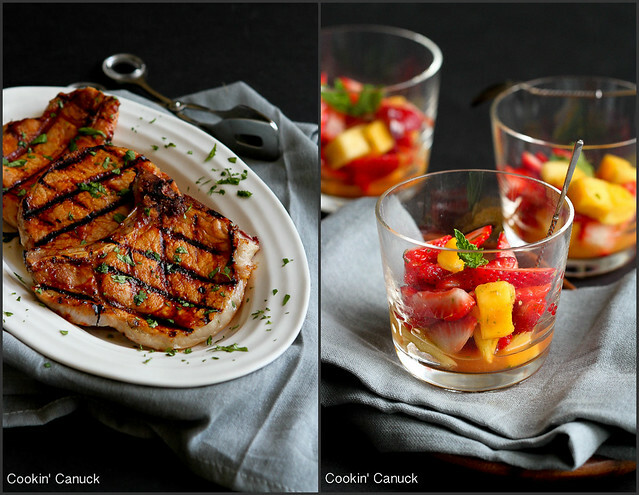 In the winter I am all about drinking and eating things that remind me of warmer months! This would be perfect for that. Love it! I love my smoothies! This is so pretty and summery, too. Perfect on this bitterly cold day! This is essentially what I put in my favorite smoothie except I also add some spinach. Dara, I need to be transported someplace warm and tropical. . with a lot of sand, ocean and sun!! 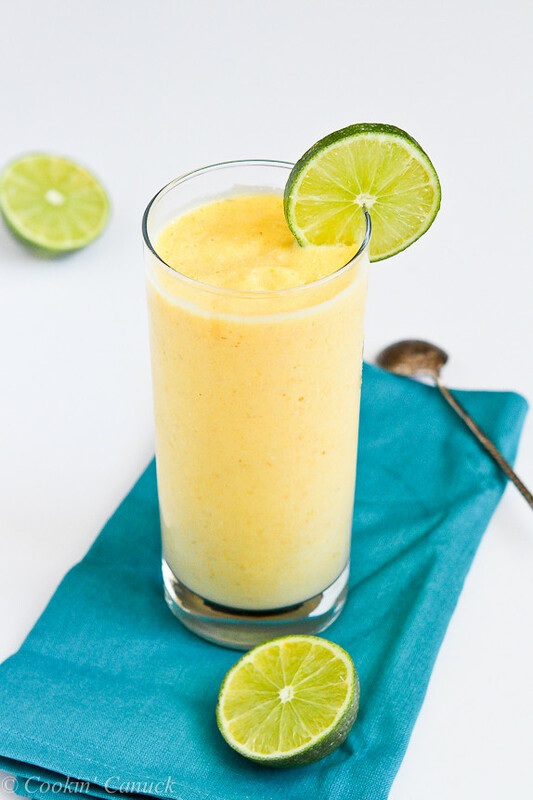 love these mango pineapple smoothies!! These are just what I need! It’s too cold here in Wisconsin! tgif! Must be something about this time of year…all I can think about is imaginary tropical vacations! This smoothie sounds perfect to aid in my day dreaming 😉 Make sure when you get shaved ice that you get it “Hawaiian Style”, with a scoop of ice cream on the bottom! Sounds strange, but trust me…life changing!! This smoothie look incredible Dara! We have been detoxing this month and having lots of smoothies, I must try this one! Oh man this tropical smoothie sounds divine! With all the snow we’ve had in Boston – I am super jealous of your upcoming trip to someplace warm and sunny! But since I’m stuck here (at least for a while) I can enjoy this yummy smoothie! These do look yummy. I wish I was in a tropical place. I’ve never added oats to a smoothie before. I will have to give that a try. Sounds like a great tip! I’ve never been to Hawaii so I can’t wait to hear what you think. It’s on our top 5 list for next year’s vacation picks. This smoothie looks so amazing, I’ll definitely be making this one in my quest to stop ever expanding waistline. Oh yes, I like oats in my smoothies, too. This sounds fantastic, I could really use a dose of liquid sunshine like this right now. I have all the ingredients in my kitchen to make this, and I can’t wait to try it. Guess what I’m having for breakfast today? I LOVE a good smoothie recipe. Mango is my favorite flavor (of everything!) and in a smoothie I swoon over it’s deliciousness.